For Women & Teens! Links are 7mm round and strand is detachable from Medical ID Tag so you can attach another Creative Medical ID strand to suit your style! 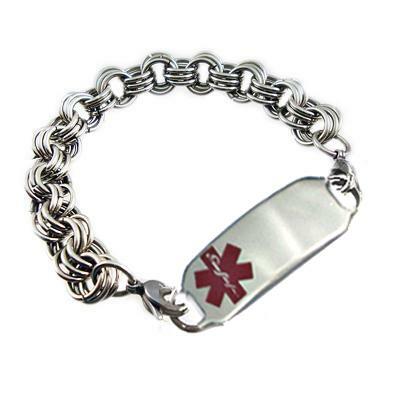 Price includes our Deluxe stainless steel medical ID tag with etched egraving, interchangeable stainless triple link chain and two lobster clasps..
Sizing: Take a snug wrist measurement, (no wiggle room) and add 1 inch in this chain style. Wrist Measurement + 1 Inch = correct bracelet size in this triple links chain style.